1. Germany leaving the EZ is totally unrealistic. It is the beating heart of it. It is a bit like amputating the healthy body from a gangrenous arm or leg. What is left is simply rubbish and you throw away the bgood parts. It could give a solution for the current debt problem but the main problems would remain. Simply that Italy and Co are not able to get to markets at normal rates and rol over their debt. Which is at the end the problem as they need to do that as they all work on a deficit. You cannot inflate that problem away (inflation plus likley some extra margin will be added up to the interest rate (and subsequently the interest rate is that high that it is unsustainable). 2. Another point is what is left without Germany (and Holland, Finland, Luxembourg, Austria and likely Belgium) is a)very weak and b)too different from each other (who in his normal mind want to be in a union with Greece). So it solves part of the problems (uncompetitiveness and current debt), but will fall apart pretty soon. 3. Eurobonds wil not save them. It will be by far the biggest junkbond with some pros re liquidity but considerably more cons as the risks attached to it can not be spread with other things as nothing junky is that size even remotely. 4. Another point is getting it organised. All countries would be involved in the frontline (not like with Greece mainly Greece itself, rest on the bench). What is even worse. It will have to be properly organised up North and therefor will almost certainly leak days or even weeks ahead. Meaning you will create a massive bankrun in all remaining EZ countries (and even in doubtful cases like Belgium and especially France). You get a bankrun if what you get after the breakup will likely be less worth of what you have now or if there are better alternatives. PIIGS we already see it now, but if say France get into the PIIGSmix the Euro that would remain would likely be rubbished as well whether it is a French one or not. The French will have a soon inflated away Euro or as alternative a move up North. Simply would create a terrible mess. Only practical way of breaking up is the weak falling off one at the time. 5. 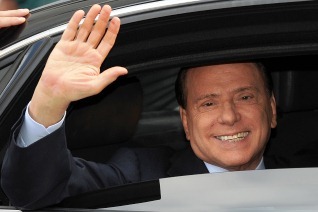 Strategical probably a good move by Silvio likely. He (and his party) is in the opposition for the next years anyway (well most likely). But things will be forgotten and the new Italian leaders will simply get part of the blame for its economically not functioning (whether with reason or not). Absolution by the Italian voter could come at the same time as the Italian public gets enough of austerity and sends the government home just to have something new (like we nearly saw in Greece). Italy leaving the euro may be a long way off; but inevitable none the less. Berlusconi is generally regarded as an oaf; but he did not get where he was by being an oaf but by being a clever and scheming businessman. And now he is scheming for the reality to come. Good for him: it will not solve all of Italy's problems but will enable solutions to exist. This is the background and the only solution is to wind-up the the Euro completely at once. I thought I'd left my name before but "Anonymous" is ME Christina Speight!! 1. As I wrote before a total breakdown is simply very complicated to do. You never can hide it from the population in general, if you look at what is now leaking. Meaning you get most likely a bankrun from France uptil more troublesome (2/3 of the EZ roughly). 2. Looking at it from another angle. Basically Germany, Austria, Holland, Finland, Luxemburg would be a 'natural match' and effectively had their currency pegged to the DM pre-Euro. Most likely as well these countries are to get together monetary again, even if the EZ would fall apart. It is the natural centre of the Euro and should have been the centre of it to start with (were it not for the Euro-megalomanics). Why first break something off that lateron you have to rebuild again. 3. To keep the European project going is would be good to save as much 'face' as possible. You would still have an Euro (and the governments in the North can say they havenot spend 100 Bns on a rescue that was destined to be unsuccessful. It is too complicated and voters are too unknowledgable to oversee it. 4. You could keep France in the Euro as well for political reasons mainly. As said above most likely avoid a bankrun there. A future high potential economic/financial calamity, but we have seen before that politicians take does risks (and the risk is much smaller than now. France is imho a borderline case and could be saved with say 100 Bn providing the whole thing doesnot collapse). 5. You have to remember that the fact that the UK doesnot like the Euro doesnot mean the Europeans donot like it. In the South the Euro is simply not an option they are even too different from each other. North basically always worked very well and already for decades. North basically likes the Euro, they simply mainly donot like the South in it. Public opinion alway found it basically dodgy countries. And the North certainly donot like to pay massively for the South. That is the no go, not the Euro itself. Rik - I'm sorry but you are, I think, living in a rational world which this long ceased to be. Matters are now out of control and the [Red] Indians are circling. Obviously if the northern euro-members are so-minded they could make it work BUT IN a federal state . The periphery will go - one way or another and the crash could well destroy France - AND BRITAIN - too. It's not as tidy and logical a set-up as you seem to think. Agree with most of what you write. It is largely un unrational process, but the next steps could always reasonably be predicted. There is clearly a considerable degree of uncertainty. I write more from the concept that (politically) unrealistic alternatives are not considered. What I think is the best realistic way forward within the politically acceptable alternatives. My personal opinion from the start was drop Greece and PSI the rest and include Cyprus in that, heavy contractual pressure on the PIIGS to start with measures that are structural and of the size required. Like cutting 10-15% (GDP) of their apparatus and welfarestate. Bankrescue against market rates, non systemic banks let thenm go bust. Roughly. Probably would have worked better and is definitely cheaper, but was and is now still not realistic. The biggest mess imho will be a total break up of the EZ in seperate currencies. Most difficult to organise (and they are not really strong at that as we have noticed anyway). This is likely to play out with Germany getting more and more strict and the South simply forced (until the have a primary surplus) to agree. Population in the South simply saying: 'no', after a few years and followed by Euro exit. So most likely one at the time and from the bottom. The North alone doesnot need really such strict rules. They have shown when the currencies were pegged that it could function well even with less strict rules as now. Gentlemen's agreement basically was enough. With the South you need a watertight contract and a baseballbat. Nobody in the North will bring by gross neglect others into danger (basically what Greece, Cyprus and Italy have been doing). Stick not only to the letter of the agreement but also to the spirit. You donot need complicated fiscal rules and banking union to make it work. It's a battle of incompetence!